It was another time, another place, a moment when criminals were invited to pose for the camera. The mugshot as an art form. Above we have one of 2500 "special photographs" taken by photographers from the New South Wales Police Department between 1910 and 1930. 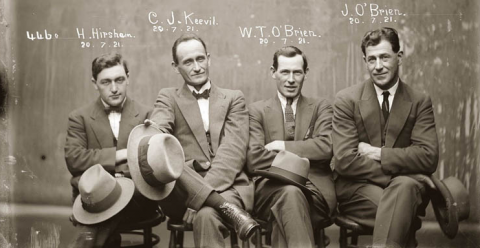 The four men (Hampton Hirscham, Cornellius Joseph Keevil, William Thomas O'Brien and James O'Brien) were arrested on charges of burglarizing the home of a bookie -- one Reginald Catton -- in April 1921. O'Brien was let off the hook, but the other three dapper ones weren't so lucky. Which O’Brien was let off the hook?